Valentines day worksheets usually have all kinds of hearts – this one has all kinds of candies in heart shaped boxes. Kids count the candies and write how many in each set. 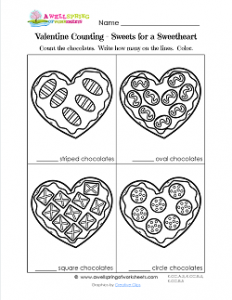 In this valentine worksheet there are four sets, each with a different shape of candy with a different decoration on them.